200-page, hardbound, 11- by 11.5-inch book published by the Center in 2015. 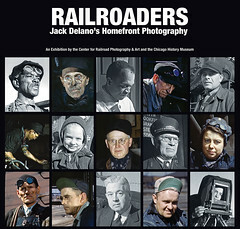 Printed in the United States, it features 108 photographs, including seventy-three of Jack Delano’s 1942–1943 views of Chicagoland railroads and their workers, reproduced in full color with rich quadtones for the black-and-whites. Contempoary photographs by Jack’s son, Pablo Delano, and the Center’s John Gruber and Scott Lothes complement the catalog. There are essays by Pablo Delano, Gruber, and University of Texas professor Jeremi Suri, a leading public historian. Biographical essays prepared by Center editorial consultant Jack Holzhueter as well as Gruber and Lothes tell the life stories of the forty-nine railroaders. Winner of the Railway & Locomotive Historical Society’s George W. and Constance M. Hilton Book Award.